Windermere, FL, February 16, 2016 – IAOP announced today the endorsement by its CEO, of the recently book, The Service Automation: Robots and the Future of Work written by Dr. Leslie Willcocks and Dr. Mary Lacity. The authors are globally recognized for outstanding, world-class research. “Service Automation is a well-structured and thoughtful book on a topic top-of-mind to professionals and executives alike. Once again, Drs. Lacity and Willcocks deliver the definitive guide.” Debi Hamill, CEO, IAOP. The book describes types of automation and gives evidence for multiple business benefits. It offers in-depth case studies from clients, providers and advisors of service automation. There are 30 key lessons on how to deploy service automation in the workplace. There is a focus on the future of work, including robotic process automation, with valuable predictions and critique. 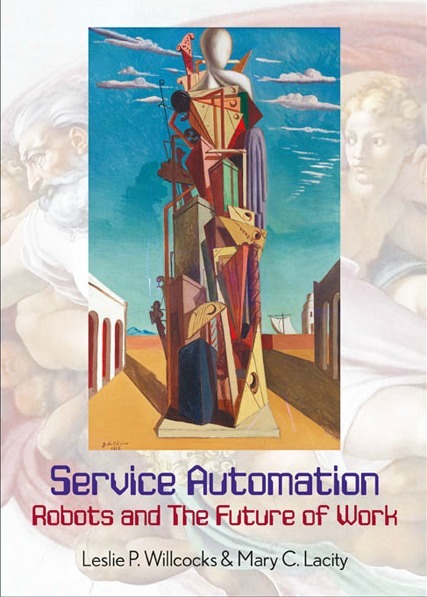 The Service Automation: Robots and the Future of Work is available in hardcover and was launched on February 12th. The book is also available at the Outsourcing World Summit in Orlando. It was published by Steve Brookes Enterprises and is available for purchase here. Dr. Leslie P. Willcocks, COP, has an international reputation for his work on global management, outsourcing, digital business, information management, strategic IT and organizational change. Dr. Mary Lacity, COP, is Curators’ Professor of Information Systems, College of Business, University of Missouri-St. Louis.